Suzanne McLoughlin (VHA), Kerry DeGaris (TWE) and Chris Brodie (Wingara). 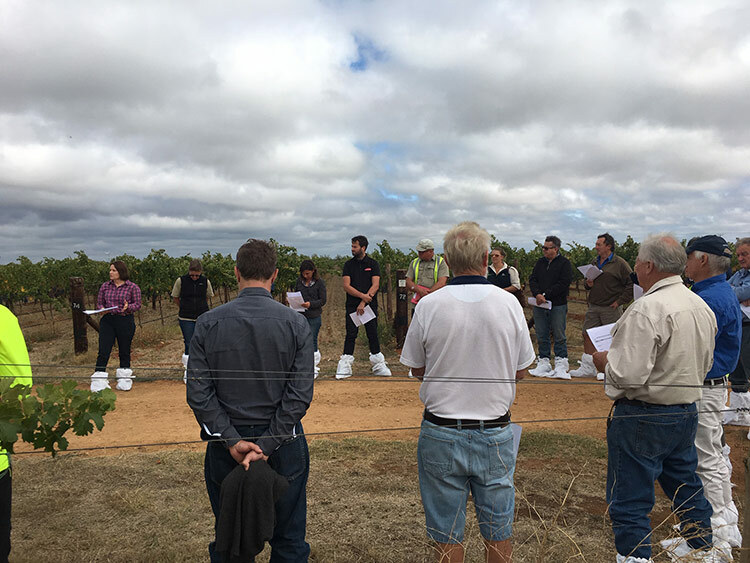 A field walk of the Coonawarra Rootstock Trial was held on 21 March, with 35 grapegrowers and winemakers attending, including many new faces since the inaugural field walk in March 2017. 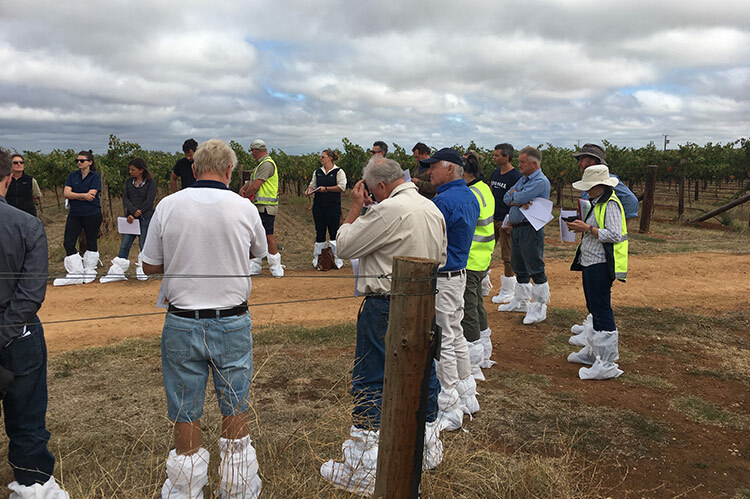 Biosecurity was a strong focus of the field walk, with participants asked to sign in and then put on two layers of disposable shoe covers while being transferred to the trial site in a bus. We discovered that putting on shoe covers in confined spaces is no mean feat. 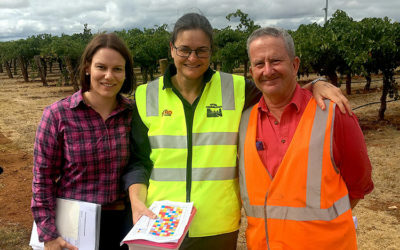 With biosecurity taken care of, participants received a map of the trial site indicating the locations of the various rootstocks and an observation sheet to complete during their walk. Vinehealth Australia Technical Manager Suzanne McLoughlin welcomed the participants and gave a brief overview of the trial. 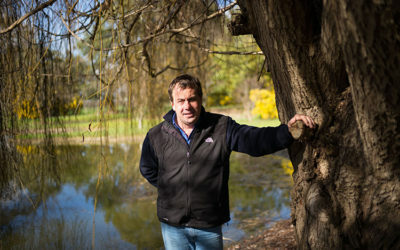 The trial, established in 2009, is a long-term joint venture between Treasury Wine Estates (TWE), Vinehealth Australia and Coonawarra Vignerons, with significant funding this year from the Limestone Coast Grape and Wine Council through Wine Australia to contribute to the winemaking costs. 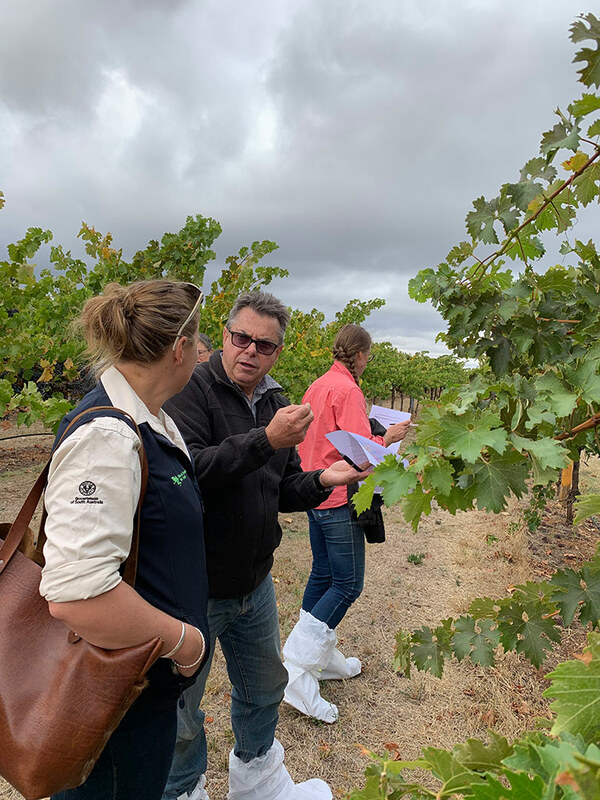 “It’s the only curated rootstock trial of this type in South Australia that Vinehealth Australia is involved in and it’s a significant project for the region to foster,” Suzanne said. 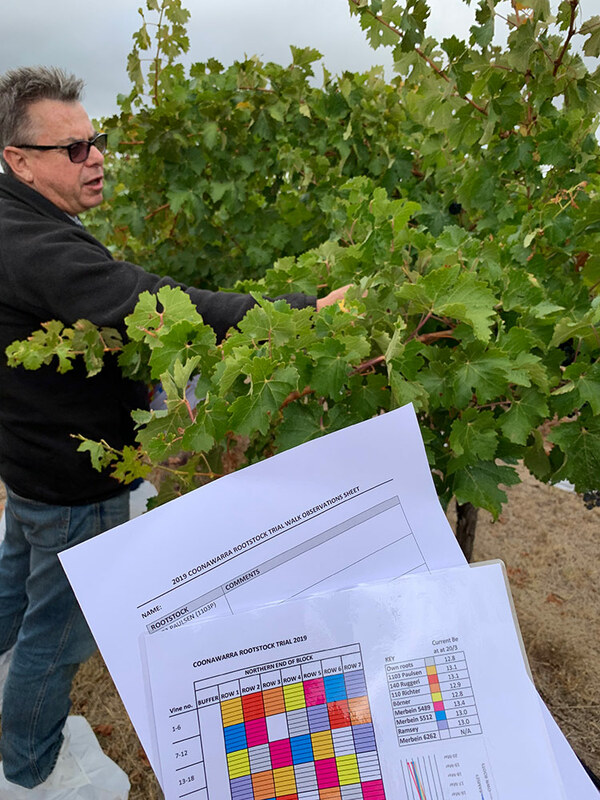 The trial studies a range of rootstocks, some not yet commonly planted, and allows hands-on learning about the attributes these rootstocks can convey to scions, to see if they adequately reflect the desired wine quality and style of the region, compared to own roots. “The trial will help the industry make informed choices about using rootstocks for future plantings, to combat the risks of phylloxera and climate change,” Suzanne said. 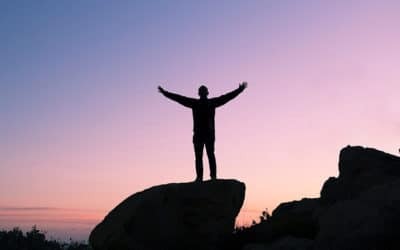 “With a randomised, replicated section and commercially managed rows we have the opportunity to learn a lot from the trial. 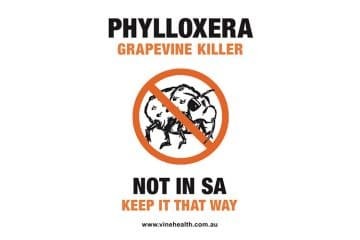 With the vines at 9-10 years of age they should be hitting their straps quality-wise. 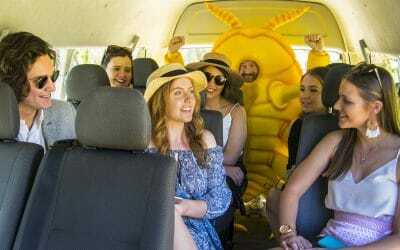 Vinehealth Australia, in partnership with Coonawarra Vignerons and TWE, is planning tastings of the small lot wines later this year. “The field walk proved a positive experience, with clear rootstock differences evident to all,” Suzanne said. 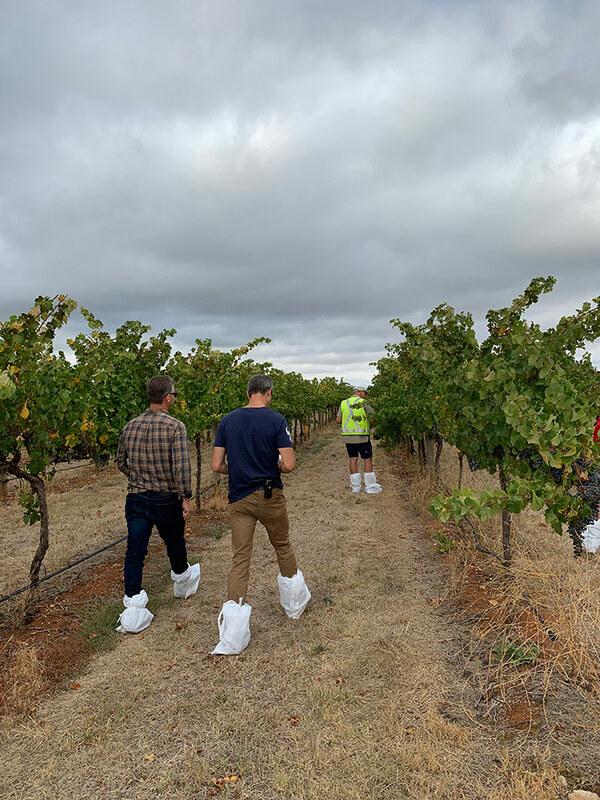 “Irrigating the trial rows ‘to the average’ rootstock this season, we noted distinct rootstock differences in terms of canopy stress. It was very clear to see that the lowest vigour rootstocks of M6262 and Börner, as well as the Own Rooted control, were suffering significant water stress this season with yellowing canopies across all replicates. Since March 21 we have had further interest in the trial and have taken another three locals on the field walk. 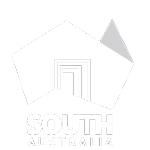 We also thank the South East Natural Resources Management Board for their contribution to helping to make the field walk a success. Stay tuned for another trial update next month.